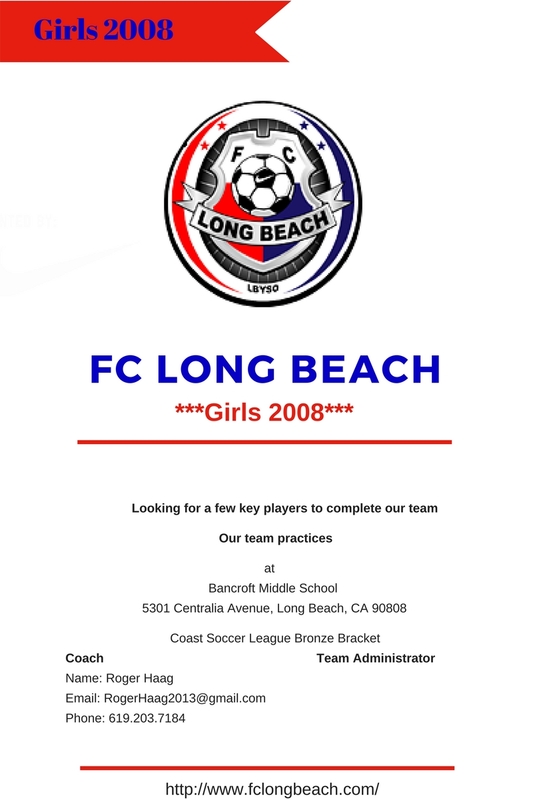 Loren Kaiser and Roger Haag are the coaches of FC Long Beach's (FCLB) Girls 2008 Red team. They grew up in Long Beach and San Diego, respectively, where they played in multiple sports, including various levels of recreation and club soccer. Both coaches have extensive experience coaching AYSO and club soccer. Coach Loren and Coach Roger's coaching philosophy emphasizes creating a learning environment that is fun, structured, and competitive in order to (1) develop each player's technical and tactical skills to play the game safely and competitively; (2) develop a sense of good sportsmanship and; (3) nurture a love for the beautiful game of soccer. Winning is not irrelevant. However, Coach Loren and Coach Roger believe that positive results in competition can only be achieved if the primary goal of the coaches is developing each player's ability to consistently execute proper soccer techniques and make good decisions during games. Coach Loren and Coach Roger keep abreast of recent developments in effective youth soccer training techniques through various licensing and continuing education courses through various organizations such as the United States Soccer Federation ("USSF") and the National Soccer Coaches Association of America ("NSCAA"). USSF "E" License "Foundations of Coaching" "Attacking Principals of Play"
USSF "F" License "Defending Principals of Play" "Key Moments in the Game"
"Get aHEAD Safely in Soccer"